Illustrations note 23 Illustrations, black and white; XV, 366 p. 23 illus. 1 Calling teachers: "To shine like the stars of heaven".- 2 Modelling our teaching on the Jesus of the Gospels.- 3 Wide-awakeness in the world: Reimagining Bible engagement in Christian education with teenagers in light of Maxine Greene's aesthetic pedagogy.- 4 Reimagining reflective practice as life-long learning for professional development within Christian ministry.- 5 Narrative as a fundamental container for 21st century spirituality.- 6 Towards a model for inclusive education in Christian higher educational institutions: A prototype program.- 7 Inclusion in education: "A piggy back will (not) do? ".- 8 You're welcome: Hospitality encounters in teaching.- 9 Teaching history for a moral purpose: Wilberforce as evangelical hero.- 10 Songs of orientation: Cultural liturgies, the history classroom and the 'winter Christian' of discontent.- 11 Transformative learning: Insights from first year students' experience.- 12 Teaching counselling from a Christian world-view: Why and how do we do this?.- 13 Hope, faith and love: Engaging the heart in the world of business.- 14 Business, education, research and theology.- 15 Education as the aspirational sine qua non for human flourishing: Case study from Bangladesh.- 16 Education: Success factor for poverty reduction, environmental justice and intergenerational equity.- 17 Investing in Australian youth: A community organisation that makes a difference.- 18 Teaching as relationship.- 19 For the love of what? 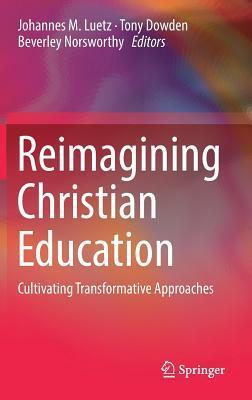 Implications of utility driven education in Christian schooling.- 20 Reimagining Christian formation in online theological education.- 21 Higher education: What's love got to do with it? Longings, desires and human flourishing.- 22 The trinity, love and higher education: Recovering communities of enchanted learning. Dr Johannes M. Luetz (PhD, MBA, BA) is Senior Lecturer, Postgraduate Coordinator and Research Chair at CHC Higher Education in Brisbane, Australia, and Adjunct Lecturer at the School of Social Sciences at the University of New South Wales in Sydney, where he also earned his PhD in Environmental Policy and Management. He has worked with World Vision on research projects raising awareness of the effects of climate change on poor communities in Asia, Africa and Latin America, and the need to meaningfully address vulnerabilities through praxis-informed education approaches. His research awards include the categories Best Thesis (2006), Aspire (2012), and Best Paper (2017). Dr Tony Dowden (EdD, MEd, BSc, BA, GradCertUniL&T, DipTchg) is Senior Lecturer of Curriculum and Pedagogy (Junior Secondary) at the University of Southern Queensland in Ipswich, Australia. He lectures on junior secondary education topics and has an active research program on the middle years of schooling, especially in relation to curriculum design. He has 60 publications and over 300 citations to his name. He completed his doctorate at Massey University in New Zealand and, in 2007, he was the recipient of the Sutton-Smith Doctoral Award for excellence in a doctoral thesis in education bestowed by the New Zealand Association of Educational Research. Dr Beverley Norsworthy (PhD, PGDipEd(Adult Ed), MEd(Hons), BEd, DipTchg) is Head of Teaching and Learning at Bethlehem Tertiary Institute, Tauranga, Aotearoa New Zealand. She coordinates, teaches and supervises within the Master of Professional Practice programme. She has leadership experience in Christian Initial Teacher Education and Schooling across Australasia. Her current areas of teaching and research include pedagogies for transformative education and people flourishing, reflective practice and visual research methods. She has examined masters and doctoral theses for universities in NZ and Australia and is a regular reviewer for international journals.